This Donaldson 4WD Filter kit for Toyota Hilux 2.2L, 2.4L, 2.8L Diesel L.Eng, 2L.Eng & 3L.Eng contains the required air, oil and fuel filters and offers savings off the individual filter prices to present a real value add proposition to your vehicle or business. Modern diesel engines require clean, dry fuel for optimum combustion, maximum power and the lowest emissions level. Dirt and water are enemies of High Pressure Common Rail fuel systems and can dramatically reduce the service life of fuel components. 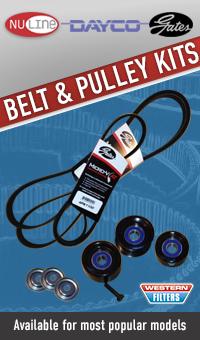 Donaldson offers a comprehensive range of service kits which include the necessary filters to make servicing easy. Their Heavy-Duty filter kits have been designed specially to protect your investment in the harshest environments. Western Filters only sells filters of the highest quality and only include reputable brands - the industry's best including; Baldwin, Briggs and Stratton, Donaldson, Fleetguard, Fuel Manager, K&N, Mann, Parker Racor, Sakura, Wesfil Cooper. **Please note: Kit photo is a representation only and may not match actual items. If you are unsure that this is the correct kit for your vehicle, please contact us for confirmation. We'll get back to you ASAP, usually within 24hrs on business days.